You’ve heard that artificial light messes up your sleep cycle. But “blue” artificial light is everywhere, from your computer screen and smartphone to your regular old reading lamp. So how are you supposed to get a good night’s sleep with all this modern technology in the way? Jeremy Maluf’s new company, Carbonshade, has plans to help. 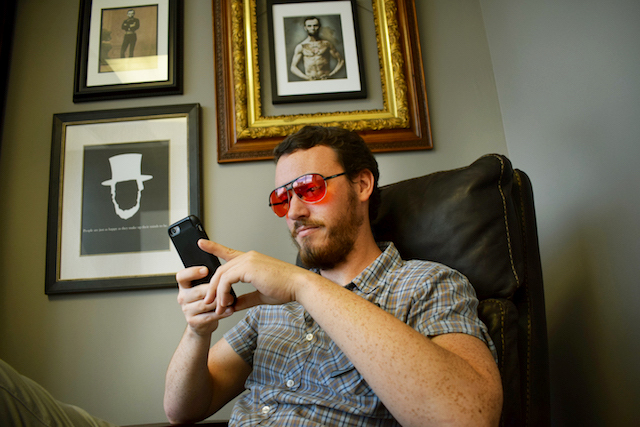 Maluf developed glasses that block this Circadian rhythm-rocking light — without making you look like an old-time accountant, a welder or a super-nerd. A rising sophomore at California Polytechnic State University in San Luis Obispo, this computer-science student turned ordinary glasses into a low-tech sleep aid. Manufactured with red-tinted lenses, the glasses are designed to be worn anywhere you’re exposed to artificial light at night. Yes, even out in public. Here’s the young inventor’s story of crowdfunding success. Maluf started working on Carbonshade in the last week of October 2015. By the first week of February 2016, he’d launched the product’s Kickstarter campaign. He founded Carbonshade after talking with another member of Cal Poly Entrepreneurs, a student organization that meets weekly to discuss business ideas. Maluf didn’t actually come up with the idea for glasses that could help people sleep better, but he realized his fellow club member’s idea had a lot of potential. “There was nothing in the market except safety glasses,” Maluf says. But his colleague didn’t have the energy or the skills to take on product development and launch. Maluf decided to give it a shot. As a college student, Maluf wasn’t exactly flush with capital. So he spent some time considering the best platform for crowdfunding Carbonshade’s initial product line. Ultimately, Maluf decided to go with Kickstarter, citing its track record of successfully backing innovative products. Maluf had also backed several campaigns on Kickstarter himself, so he knew what went into a good crowdfunding campaign before launching his own. He’d need a product, a page and a video demonstrating his shades. Maluf was able to take Carbonshade from idea to viable Kickstarter campaign for less than $1,000, which covered developing prototypes, completing product photoshoots and making a video that brought Carbonshade’s Kickstarter campaign to life. But that doesn’t mean Maluf didn’t face challenges as he prepared to launch his crowdfunding campaign. Friends and a few willing students pulled an all-nighter — college style — to film the video. Maluf didn’t love the final result, but thinks the strength of the campaign page overall helped Carbonshade’s Kickstarter do so well. Carbonshade exceeded its crowdfunding goal of $12,000, bringing in a total of $15,523 from supporters. The prototypes Maluf mentioned above weren’t made by hand at his own desk. The process of finding a manufacturer willing to make test runs of his shades helped him decide on what company would make the full product line. “After we figured out we wanted to do it, the first thing was to find a manufacturer in China, which we did through Alibaba,” Maluf explains. He ordered prototypes in November for beta testing, emailing his chosen manufacturer in China to review necessary adjustments. Don’t assume Maluf has piles of tinted glasses all over his bedroom — yet. Maluf hasn’t paid himself yet, but plans to be able to once the Carbonshade web store starts receiving regular orders. Improving on a common or much loved item is a good place to start — making adjustments to form or function can be powerful. “After many iterations you have the best thing possible,” Maluf says. He enjoyed his crowdfunding process so much he has five more Kickstarter campaigns planned for 2016. Up next? Sunglasses that serve as a USB charger for your phone. Maluf’s 20-minute prototype experiment resulted in a sleek alternative to jamming a phone charger cord into your clutch or pocket for an Instagram-packed day out. He plans to launch a crowdfunding campaign for that product later this summer. If he can replicate his earlier success, we may need Maluf to write the book on using Kickstarter for product development. Your Turn: Have you started a business because you had an idea for an invention or a product improvement?